The big news this month is E-Mail Relay Addresses! You can now send a message to your troop, crew or pack without logging on to your site. Each unit has an e-mail relay address pre-configured that will go to all active members. You can also set up relay addresses for dynamic subgroups that will go to the current members of that subgroup. There are two new inventory reports. 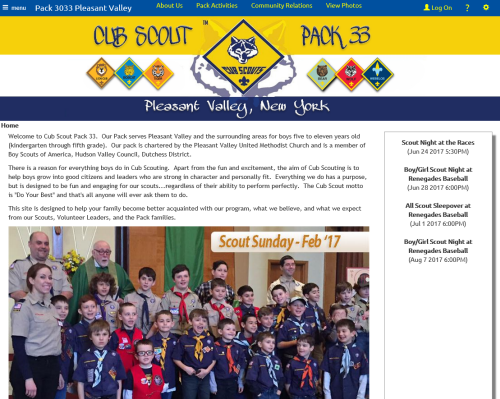 Pack 3033 of Pleasant Valley, New York! Pack 33 really has it going on, especially when you consider that they just started up their site in April! They created numerous custom pages explaining the scouting program. Their color scheme, layout, and unique graphics make the site a pleasure to peruse.